Get totally comfortable sculpting in a digital environment with the latest edition of this bestselling beginner's guide to ZBrush. 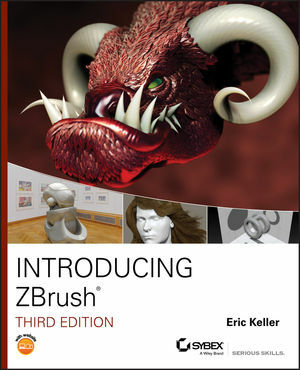 Fully updated for the newest version of the software, ZBrush 4R3, this book dispels any fears you might have about the difficulty of using ZBrush and soon has you creating realistic, cartoon, and organic models with flair. Learn all the essentials, as you complete fun tutorials on painting, meshes, organic scripting, hard surface sculpting, lighting, rendering, and more. Design remarkably realistic creatures, people, and objects with ZBrush and the new edition of this top-selling guide. The DVD is not included as part of the e-book file, but is available for download after purchase. Eric Keller has been a visual effects artist since 1998, creating animations for feature films, commercials, motion graphics, and scientific visualizations. He has been teaching digital sculpting at the world-renowned Gnomon School of Visual Effects in Hollywood for over three years and has created video tutorials for Pixologic's ZClassroom, working directly with the developers of ZBrush. He is the author of Mastering Maya 2011 and Maya Visual Effects: The Innovator's Guide (Sybex).